No coffee, Forgot the Filters! This is our Second guest post on Chief Cyclery. James is a super talented graphic designer that lives in the valley. I have been following James on Instagram (better known as @recycled_android) after finding him through our shared passion for thrifting and bicycle commuting. Not only are his graphic design skills on point, he is also an amazing photographer. I have been inspired by his feed and reached out to ask if he would be interested in sharing something for our site. I was thrilled when he sent his write up and pictures over, especially since we need all the inspiration here during the 115 Degree Arizona Summer months. My adventure takes place during Thanksgiving weekend 2015. Needing to escape the city and crazy holiday shopping I decided to #optoutside, get out on my bike and do my first bike overnight. 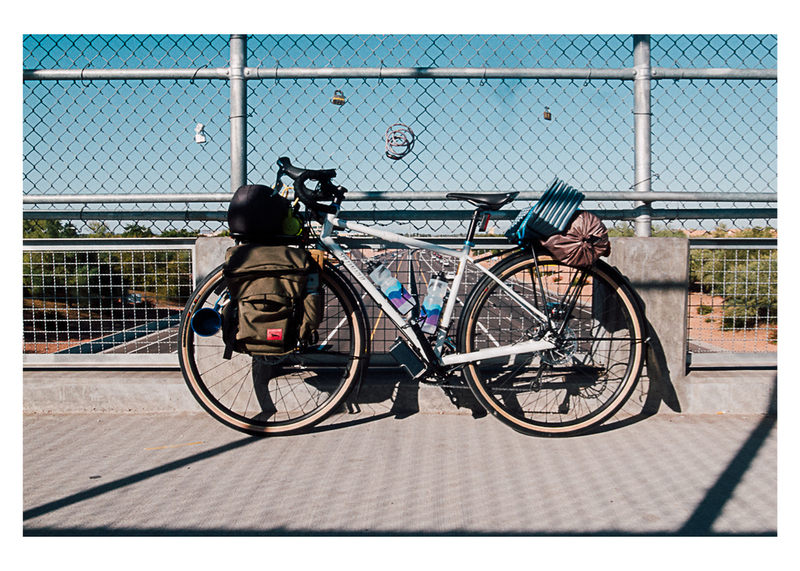 I loaded up my Specialized AWOL with panniers, packed up my stove, a slingshot, extra wool shirt, a tent, and sleeping bag, ohh and a big knife. Just in case. I'm Akimal O’otham and have grown up on the Gila River reservation most of my life. Currently I’m living in Chandler since it is close to my job. Its interesting growing up on the reservation, its quiet and always open, you literally have a connection to the land around you, knowing that your people have been apart of this land for thousands of years. I decided to head out to the reservation outside of phoenix to camp out at one of our buttes, Pima butte to be exact. On June 1, 1857 the Yuma, Mohave, Apache and Yavapai warriors attacked a Maricopa village called Secate on this very butte. This was one of the largest battles in Arizona’s history. It was also the last major battle between Native Americans in North America. Read more here Battle of Pima Butte. Some people thought I was crazy for camping out overnight at this mountain; many believe that spirts would bother me, hence the big knife. But I’m not sure what a knife would even do in that type of situation and to be honest, I wasn’t afraid. I felt like the spirits knew I wasn’t there to bother them, and they would leave me alone. I left Chandler about noon and headed south, taking it slow and snapping photos along the way. The ride is pretty empty and the last stop for water is about 8 miles from where I was headed. I arrived about 3, set up my tent, gathered some wood and cooked some pizza over the fire. The pizza didn’t turn out the way I intended. I ended burning the bottom and having to eat just the toppings; note for next time: take some tinfoil. After dinner I got ready for bed, drank a couple sips of whiskey and fell asleep to the sounds of coyotes and owls hooting throughout the night. The next morning while I packing up I noticed in the sidewall of my tire a huge tear, instead of heading home I decided to pedal the 7 miles to my mom’s house and call up my wife to come and pick me up. It was a great first experience heading out on my bike and camping out under the stars. I’m looking to do this again sometimes in the future once it cools down. Also just a heads up: the community is considered sovereign land, and if you are not a community member and you venture off the beaten path you can be charged with trespassing, so please don’t attempt to camp where I did. If you missed our first guest post by Jonathan McCurdy (@velotramp) I suggest you go check it out as well: Exploring the Northern Arizona Vortex! I can't wait for read more from both Jonathan and James!